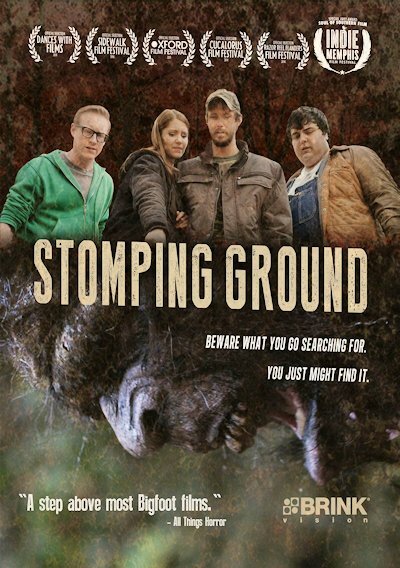 There’s something “abominable” stalking the woods of North Carolina in Dan Reisser’s “Stomping Ground”, which comes to US VOD and DVD this month. Young couple Ben (John Bobek – When a Stranger Calls) and Annie (Tarah DeSpain) are visiting Annie’s remote home town in North Carolina, when some of her old friends suggest going on a camping trip like old times. This is done under the guise of going on a ‘Bigfoot Hunt’, as local legends persist of a sasquatch type beast living wild in the forest. But despite Ben’s initial reluctance, they eventually decide to go as it will be a good excuse to just get drunk and party in the woods. 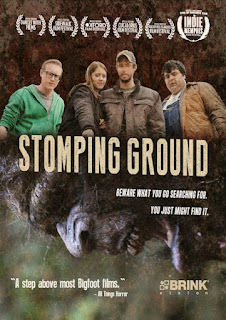 "Stomping Ground" is a low budget indie film, but looks like it had more money than it probably did. Its competantly filmed, the actors can actually act and makes good use of its scenic woodland location. The plot is kind of like an updated version of the old 1980s film “Night of the Demon”, but with elements of “Straw Dogs” mixed in (and arguably Blair Witch, but minus the shaky camcorder footage). The film is a bit slow to begin with but proved quite entertaining when the beast finally shows itself and proceeds to start making mincemeat of the campers, which proved (possibly unintentionally) to be quite amusing in places. The film is released to US VOD outlets and to US DVD March 8th. "The Lesson" - A Review!!! LAST GIRL STANDING - A review! Bernard Rose's FRANKENSTEIN" - new clips. "Deadly Famous" - A review! BACKTRACK on DVD and Digital Mar 14.